The use of an electric fuel pump, as a replacement for traditional mechanical pumps, has increased in performance street and strip applications. An electric fuel pump has advantages over a mechanical fuel pump even for carbureted applications. An electric fuel pump doesn’t rely on the speed of the engine to move fuel resulting in even, steady, fuel pressure throughout the system. An electric fuel pump has the potential for much higher fuel pressures than a mechanical pump, and this can create drivability issues in carbureted applications if not kept in check by a fuel pressure regulator. Since 1983 Spectre Performance has designed and offered unique, innovative, parts and components to fuel your car or truck obsession. In addition to the performance air filters, muscle car air intake systems, and late model intake systems that Spectre Performance is best known for; Spectre offers a huge variety of accessories to fuel your passion for performance. One such example is a pair of new fuel pressure regulators designed to keep the right amount of fuel flowing into your carburetor. Both the 2518 and 2519 adjustable fuel pressure regulators from Spectre Performance feature robust cast construction with a bright plated finish for durability. They include a 3/8” NPT single fuel inlet and dual 3/8” NPT fuel outlets. A plug is included if your application calls for only one fuel outlet to the carburetor. The second fuel outlet can also be used with a fuel pressure gauge. 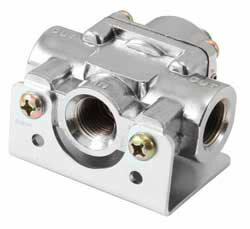 The fuel inlet and outlets can be used with the included hose barb fittings, or with AN fittings purchased separately. 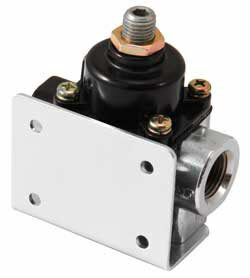 Both Spectre Performance fuel pressure regular units include a mounting bracket and screws for ease of installation. 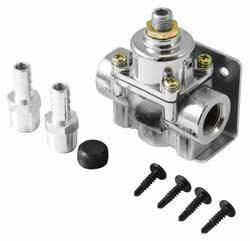 Spectre fuel pressure regulator 2518 is intended for carbureted engines needing between 1 and 4 PSI. This fuel pressure regulator would most commonly be used on smaller import vehicles, or domestic applications with 2-barrel carburetors. 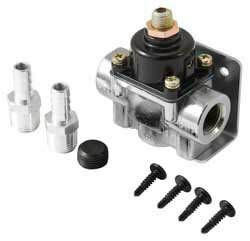 Spectre fuel pressure regulator 2519 is suitable for larger domestic vehicles with V8 engines and 4-barrel carburetors. Part number 2519 can be adjusted between 5 and 9 PSI. While these regulators are easily adjusted using basic hand tools it is highly recommended that they are not adjusted without the aid of a fuel pressure gauge. Improper adjustment can result in excess fuel pressure and engine flooding. Spectre Performance offers two styles of Fuel Pressure Gauges, number 2515 or 59013, to make dialing in proper fuel pressure a breeze. Use of a fuel filter before the Spectre fuel pressure regulator inlet is highly recommended, and Spectre Performance offers a variety of fuel filters to meet varying needs and preferences. Take the proper precautions when working with fuel system components. Make sure to use a suitable thread sealant with PTFE on all threaded fittings for a proper seal. After installation check all fittings and verify that no leaks are present. Whether your fixation happens to be a classic pickup or muscle car, Spectre will help fuel your passion for performance. Browse all Spectre automotive products by category at SpectrePerformance.com. While you are there use the Products by Vehicle Search to find Spectre performance products specifically made for your vehicle. To find a Spectre dealer near you use the Spectre Dealer Locator.